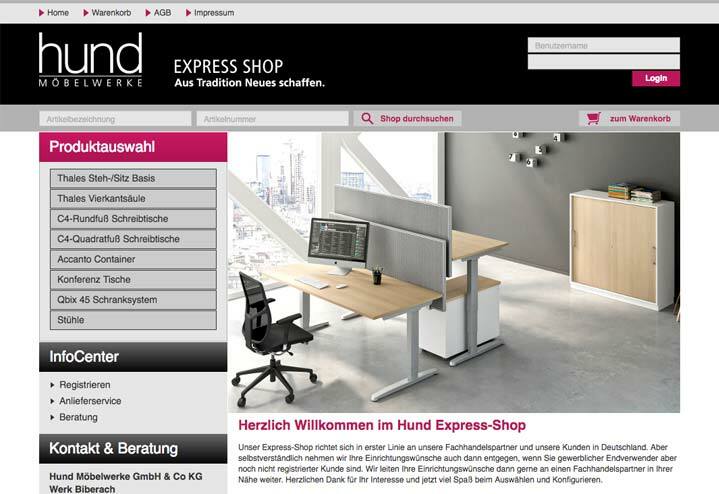 Online express shop | HUND MÖBELWERKE | The fast way. The fast way to meet your furnishing needs. Our Online express shop is aimed primarily at our specialist retail partners and our customers in Germany. But, of course, we also accept your furnishing requests if you are a commercial end-user but not yet a registered customer. We will then be glad to forward your requests to a specialist retail partner in your area. Take advantage of our business customers shop and order directly from Hund Möbelwerke. You can be sure that our quality products will be delivered quickly and reliably. Our shop module on your specialist retail website guarantees a professional appearance with a customised design. Just the right thing to convince your customers of your and our quality of service.